This morning was assessment day with Annie. 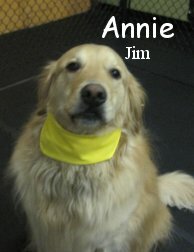 She is a cheerful, four year old, seventy-two pound, Golden Retriever. We tried Annie in the Medium Roll and she did pretty well, she even played a little bit, which is always good on a first day. Annie's niece, Gracie, has been coming to The Fort for about a month. I'm sure we will see the two in action here someday. Annie is welcome to comeback to Fort Fido anytime. We are glad that she seemed to enjoy her stay and hope to see her back soon. Take care, stay dry out there today!